I had never used mineral makeup before this is my first time I'm going to share about mineral makeup. I had heard a lot about mineral makeup but never tried them. 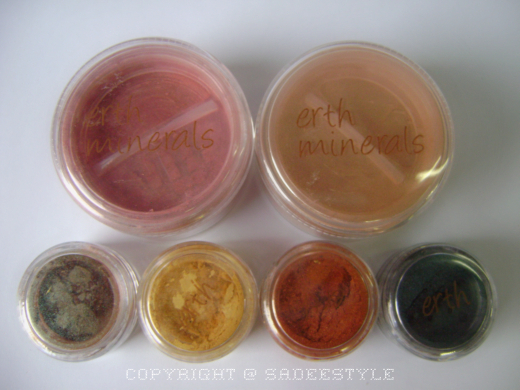 This is my first experience with mineral cosmetics I decided to try erth minerals after reading many good reviews on different forums and blogs. Erth mineral is Canadian based cosmetic brand. 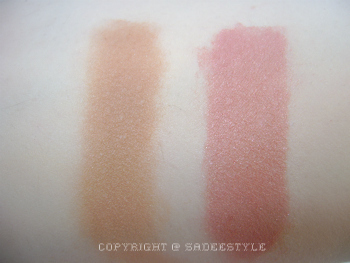 One of our newest additions, Zinnia is a soft yet deep dusty rose. Slight golden and pink opalescence. A flat, soft version of our Warm bronzer. Think golden tanned skin. Soft & no extra shine. A orangey, gold with lots of sparkle. A lovely brown with lots of lovely green sparkly undertones. Our best selling shadow! A deep, sparkly green with strong black undertones/sparkle. A light, earthy brown. Pearlescent. Erth mineral eye shadow are 100 percent natural contain mica, titanium dio oxide and preservatives but not harm chemicals or color or dyes their staying power is great very easy to blend but I'm always afraid of using mineral cosmetic because of their fallout it can create a mess but with little care you can apply them properly. I'm very impressed with these eye shadows, these are very pigmented and shimmery but not glittery I love natural, neutral colors and hate glittery. 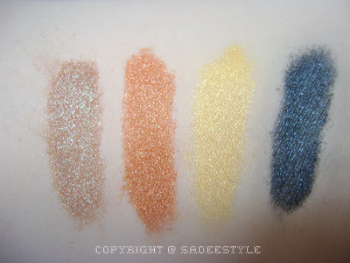 I also love the pigmentation of gold and orange color they both are my favorite colors. Overall these products are really good. I love their flawless formula. Both colors are equally beautiful, staying power is good. It do not smudge or fade and give beautiful diva shine to the face. Colors are extremly beautiful and bright. You can make it as bold or light as you want. It has macro sparkles but its not glittery at all. I highly recommend it no matter what skin tone you have. ooo, so pigmented! checking out the site now. Thanks for shopping with me, Sadee! If you enjoy shopping, drop by again at www.anaviajera.com soon as I'll be posting about shopping in Hong Kong and brands for less in the USA! also, you might want to visit www.cheriecity.com. It's a great fashion and beauty site! They seem to be great products! Hope they are sold in Italy too! Come to visit my blog when you have time and if you like let's follow each other!! Erth is currently offering a buy 1, get 1 free lip gloss deal! You get a full-size Blossom gloss with the purchase of any other gloss. Give the "spicy collection" a look!! Enter code: gloss186 at checkout.